Arbors and trellises are decorative wood elements that can transform your outdoor living space into an attractive focal point. Use a trellis against a blank wall. Add an arbor to your main entry, your garden or above the garage doors. 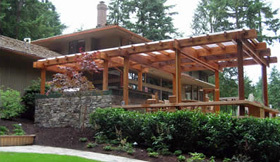 We specialize in custom arbor, trellis and gazebo designs in all shapes and sizes, using a full range of woods and other quality materials. We work with you or your architect to implement your plans. If you decide you want assistance, we help with your concept and design. Be the showcase in your neighborhood with the added charm and elegance of an arbor, trellis or gazebo! For further information or to schedule a consultation, call 425.868.4114 or email us.